Unique Diaphragm Couplings use highly flexible Diaphragms. These consist of Rubber reinforced with Nylon Chords. Further at inner and outer bolting PCD Steel ring reinforcements are used. Torque ratings are determined after extensive tests and have large service factor against rupture. Rupture torque is typically 6 to 10 times rated torque. At nominal torque torsional angle is large - typically 10 to 15 degrees. Torsional Stiffness is low. This results in low critical speeds , usually below operating speed. Further torsional stiffness varies with load. At lower loads stiffness is lower. The Feature allows operation at wide range of speeds.Favourable damping charactistics	ensure vibration amplitude are limited at resonance. 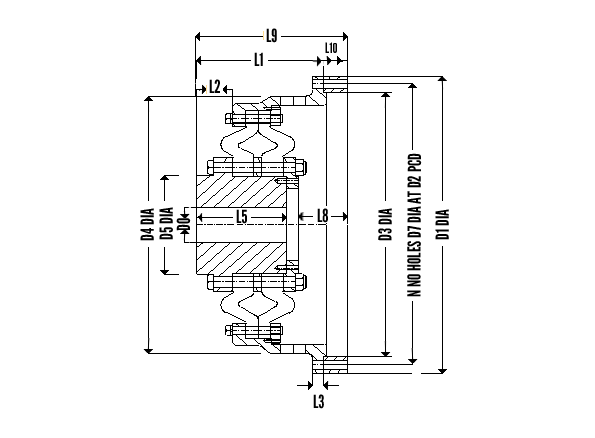 Design Series - Series 1000 , Series 1100 are for Direct Flywheel mounting. Series 1750 are for shaft to shaft connection. Series IP are suitable for diesel drives in association with cardan shaft - highly popular for Diesel driven vertical Turbine Fire Pumps. First selection is based on nominal torque , Max bore , Max speed , end fitment.